Continuing from my first thread (gas tank replacement), Sunday morning Brian and I took Peer Pressure out for a test ride to get breakfast, and everything seemed to be working great. We had some food and then adjourned to the garage to begin our second project: cutting steel for new rear bumpers. We took our cues from a couple of different writeups here on the BP, especially this one this one and this one, and a number of different pictures and other references from around the web. What we originally imagined and what we wound up with are two different things, as you’ll see here. The first thing Brian did, months ago, was find us the hinges. He got them here: Guardian Gate hinges He got the 2000 series unprimed model. From there, we worked with the specifications some other folks had used, and bought a length of 6″ x 2″ 3/16″ box steel as well as two pieces of 2″ x 2″ in the same thickness. The first step was cutting the bumpers down. 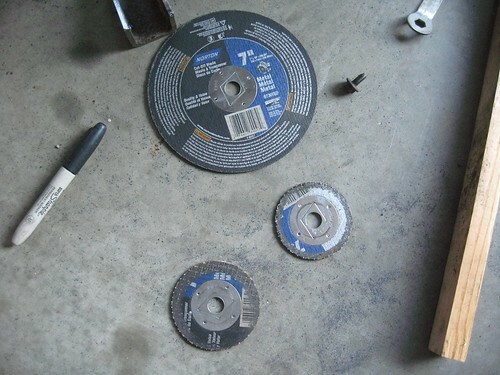 We used a very durable Porter & Cable circular saw with standard metal cutting blades. We decided to keep the width the same as the stock steel bumper, so they got cut to 64″ wide. Next, we cut the swingarms 54″ long and mocked them up roughly on the bumpers. We originally debated mounting the swingarm on top of the bumper or on its face, and finally decided to mount on the face 3/4″ outside the edge of the endcap so that the tailgate can be lowered with the swingarm at a 90˚ angle. 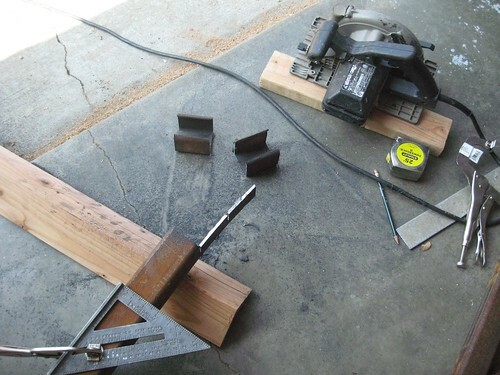 Next was the cradle for the swingarm, which came from 2.5″ box steel. Brian notched out one side by hand and we sliced two of them off. From there, we pulled out our spares and laid them down on some board to mock up the vertical tube. 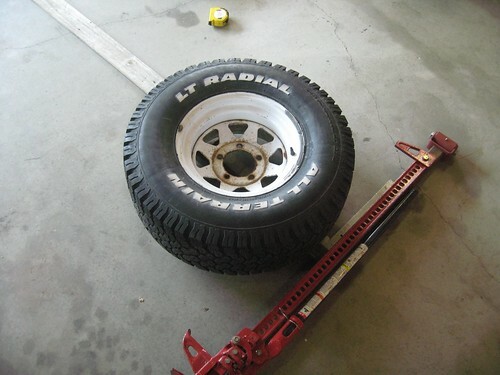 Originally we were going to mount Hi-Lift jacks on the two support bars below the tire, but as we looked at it in person, we thought it would raise the tire too high. (we’re both paranoid about the welds giving way and the whole thing falling off the back of the truck into oncoming traffic). 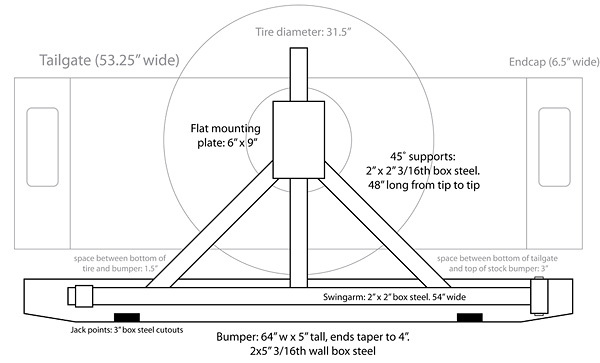 We both agreed that we’re not going to be running anything larger than a 32″ tire for the foreseeable future, so we settled on that as our baseline size. We decided to lower the spare to about 1.5″ above the swingarm–mine will be 1″ higher than his–and mount the jacks on the face of the swingarm. The vertical bar is 28.5″ high. We lengthened the support arms so that they make a triangle right where the standoff for the tire mounting plate will go. With that figured out, we cut four support arms down and laid out the triangles on the floor. It was looking like we were going to finish it all up quickly, but then it slowly dawned on us that we had a ton of smaller cuts and pieces to make. 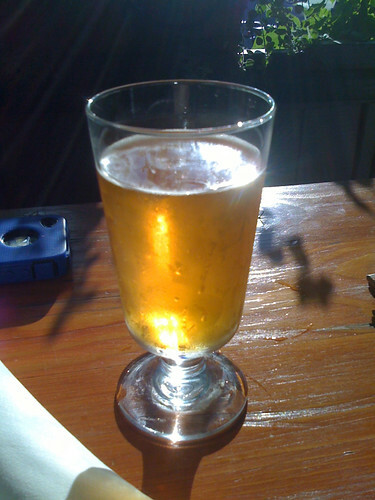 Luckily it was about this time we took a break for lunch, changed into clean clothes, and stopped over to a friend’s house to watch him brew a Belgian triple while being interviewed for the local paper (and sip on a Dogfish Head 90 Minute while doing so). Suitably refreshed, we returned to the garage. I’ll probably remember this out of order because it was hotter than the hinges of Hell that afternoon, but next we cut two standoffs for the tire mounts and attempted to cut braces for them. Then we measured for standoffs on the frame and cut those from the 3″ box so that the new bumpers will sit roughly at the same height and depth as the stock steel bumpers do, providing enough clearance to lower the tailgate and access the hitch below. Brian took on the four most difficult cuts himself, which were the shallow angles on either end of the bumpers. We sloped them 6″ from the ends and 2″ from the bottom. 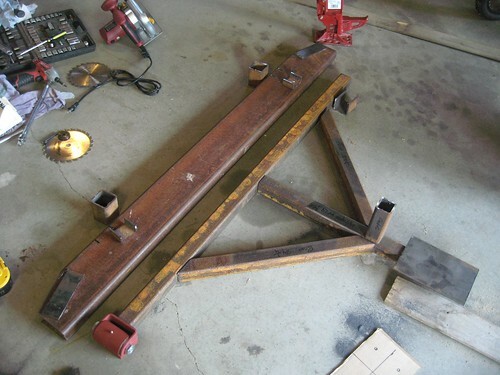 Then, we used some cardboard to measure and mock up flat steel for the spare mounting plate; that piece is a 6″ x 9″ rectangle aligned vertically so that we can use three of the five bolt holes on the spare. Then we cut a bunch of small plates to seal up all of the open ends of tubing. We made notches for jack mounting points on the bottom. We sliced our remaining 2.5″ box in half and then cut four notches out of the top. Then we measured 12″ from the ends of the bumpers, centered them on that mark, and notched the bottom out. 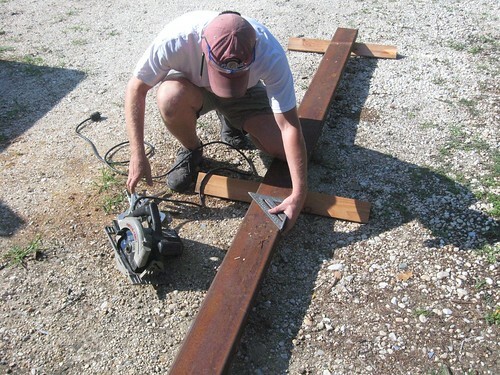 This cut is the only one we couldn’t make with our limited tools; we’re going to hire a professional welder to connect everything and have him use a plasma cutter to chop those bits out before welding in the notches. 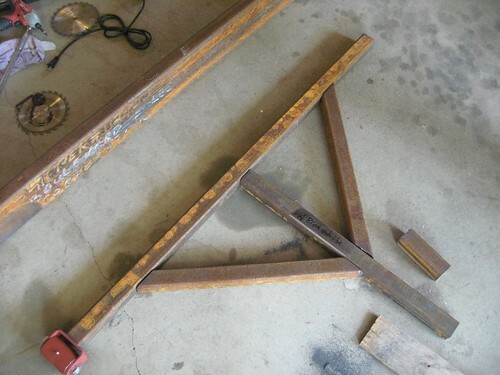 The last four cuts were angle iron for mounting the whole assembly to the frame; we’re going to weld the angle so that it’s on the outside edges of the frame rails and bolt the bumper plates to that, as well as the crossmember–we are taking everyone’s warnings into consideration. By this point it was about 5:30 or so and we were whupped, so we called it a day and cleaned up the shop. 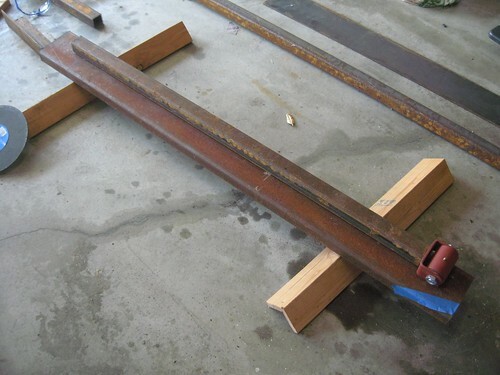 I think we probably have a couple of small things left to do–cutting plates for the bumper standoffs comes to mind, as well as gussets or braces for the tire standoff–before we’re ready to call in a welder. We also need to run power out to the arm and come up with some kind of lighted license plate bracket that’ll mount inside the wheel. Brian’s goal is to get his bumper mounted and ready by September 1 for a vacation trip, and I’d love to have mine by then too, if possible. This took two guys about six or so hours with minimal steelworking equipment: A circular saw, four metal blades, some clamps, angles, and a flat surface in the shade.